Sitting under continuous arches, lined with white tiles and illuminated by nautical-themed chandeliers, the Grand Central Oyster Bar and Restaurant is one of my favorite places in New York City. As a kid, I was never a fan of oysters, but I was taught that they should be eaten on New Year’s Eve for good luck in the coming year. 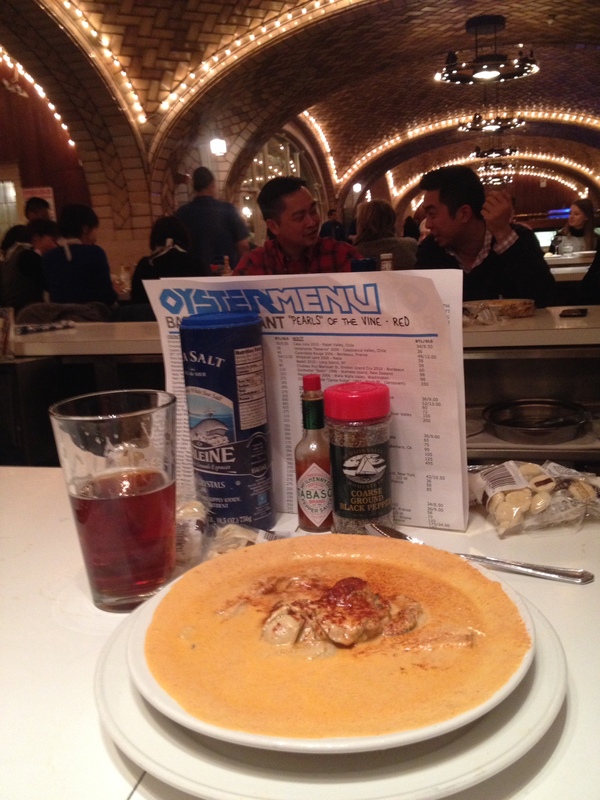 So, today, for the second year in a row, I will have lunch at the counter of the Grand Central Oyster Bar. Today, there is really only one restaurant in the city where diners can experience the oyster in its full glory, and that’s the Oyster Bar in Grand Central Terminal, a boisterous throwback to the days when stews, chowders and pan roasts reigned supreme…. For a certain kind of dining, nothing can beat it. At least once a month, I sit at the low-slung lunch counters for a half-dozen oysters on the half shell, an oyster pan roast and a cold beer. Everything about the experience — the din and the tumult, the oyster shuckers working double-time, the vaulted tile ceilings — is almost transcendentally New York. Lunch at the Oyster Bar is a sure-fire recipe for human happiness. I’ve always been fascinated by the history of this restaurant. It’s been in almost continuous operation since Grand Central Terminal opened in 1913. I want to see this restaurant in its early years, and I want to know how the restaurant survived Prohibition, the Great Depression, the decline of passenger rail, and the city’s decline in the 1960s and 1970s. Unfortunately, a search of newspaper archives does not say much about the restaurant in its early years, but descriptions abound from the 1960s onward. A 1947 New York Times article about how to cook seafood mentions that diners will wait 20 minutes for a seat at the Oyster Bar. But the 1939 Dining in New York with Rector; a personal guide to good eating reviews dozens of Manhattan restaurants, omitting the Oyster Bar. In 1913 when the terminal was opened the oyster bar was a small counter with 3 or 4 seats, set off in a corner of the restaurant. The Oyster Stew served there soon, like the proverbial mouse-trap, brought the world in a well-beaten track to this counter. It was extended and extended again. The number of seats and specially contrived cooking bowls were both augmented. Today, there are 42 seats, which never seem sufficient to accommodate the hungry crowds that in rush hours sometimes stand three deep. Commuters, snatching a hasty snack to tide them over until dinner at home, form a large portion of its regular customers. The chefs here have that blithe and wonderful notion that calories were never invented. The fame of this institution is world wide and is based primarily on rich and buttery seafood stews and pan roasts. Unfortunately, the deep-fried dishes do not come off as well. Seafood stews from $1.75. Cocktails, wine and beer. 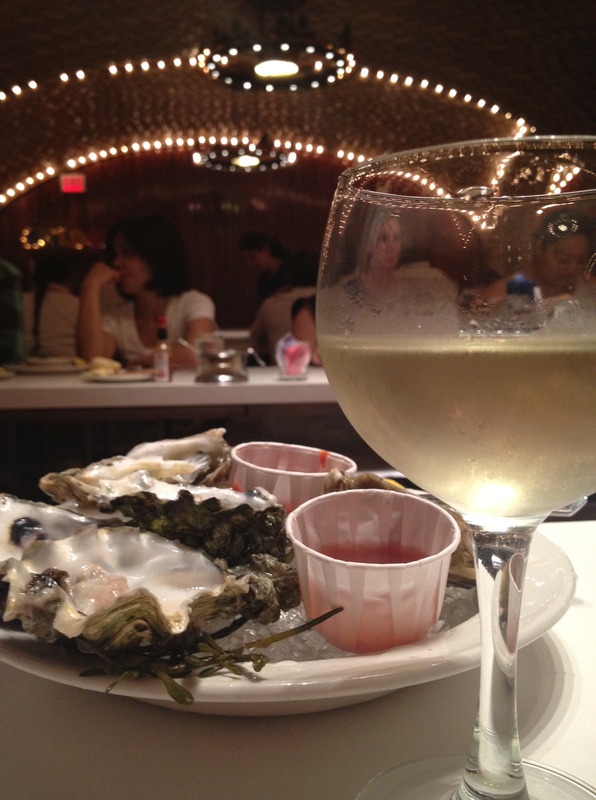 Before heading downtown, the traditional center of great seafood in New York, stop for the “succulent oysters of the deep” at the Oyster Bar in the lower level of Grand Central Station (MU 9-0776, lunch and dinner Monday through Saturday, closed Sunday, major credit cards). Please sit at the counter. The tables are dreary. 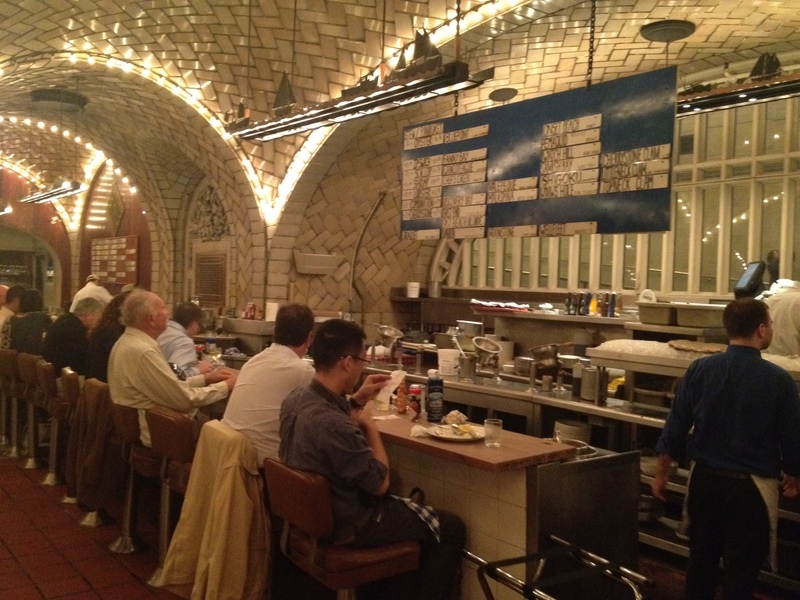 But the counter is the city’s classic oyster bar. Somehow, the oysters taste better here, more marine. Six cost $1.75. And their “famous” oyster stew is a rich dairy broth with more of the celebrated bivalves floating within. At $2.90, this stew is one of the great values, not only in food, but in anything. Critics have long regarded the bar, where fine seafood was prepared on full view, as outstanding in the city, while the restaurant proper was mediocre. Place all but the cream in a deep pan and cook briskly for a minute, stirring constantly. Add cream. When it comes to a boil, pour over toast in a soup plate and serve. Today’s customer of the Grand Central Oyster Bar and Restaurant can hardly imagine that the old Oyster Bar, while its title suggested seafood, was not, in fact, a seafood restaurant. Its oyster stew had become famous, but the rest of the menu could best be described as ‘continental.” Our job of invention would start from scratch—but seafood it would be. To prepare for the decision, my wife and I toured the best-known seafood restaurants in Manhattan, Brooklyn, New Jersey, and the rest of the metropolitan area, and they were invariably full—even when the cuisine was ordinary. That is what decided me to take a chance—the same kind of chance I had taken with restaurants such as the Forum of The Twelve Caesars, the Rainbow Room, the Four Seasons, and Gallagher’s. And so, in 1974, I entered into a lease with the MTA, and embarked on inventing the Grand Central Oyster Bar & Restaurant. 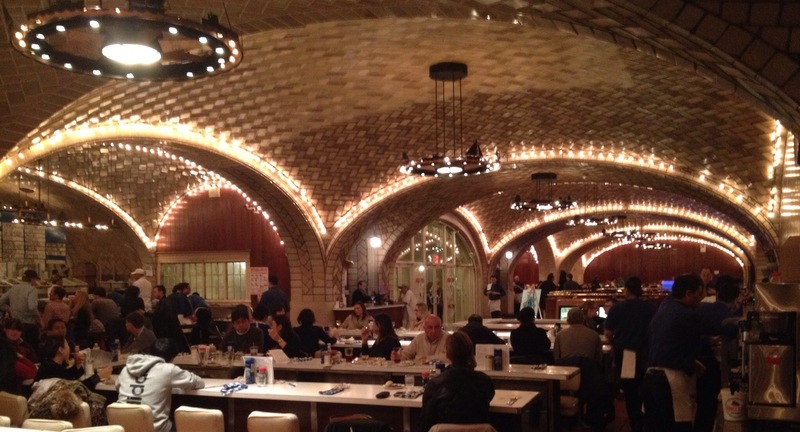 The Oyster Bar in Grand Central Terminal is back in business, under new management, following a gentle facelift to preserve its style and traditions, which span an incredible 62 years. Several former employees are back behind the bar turning out steaming bowls of creamy, paprika-flecked oyster stew according to the original recipe. And there’s a new open window, with stand-up service counter, on the ramp going down to the lower level where a commuter can down a half-a-dozen freshly shucked Bluepoints before boarding the 5:09. In 1981, the Gault Millau Guide to New York, published only in French, gave the Oyster Bar “two toques and 15 points” (out of a possible four toques and 20 points), putting the restaurant on par with Cellar in the Sky, Claude’s, Lavin’s, Raphael and La Tulipe, and just under Lutece and the Four Seasons (three toques and 17 points), and La Cote Basque, the Palace, La Plaisir and the Quilted Giraffe (two toques and 16 points). The restaurant suffered a devastating fire in the early morning hours of June 29, 1997, starting from an overheated motor in a kitchen refrigerator. Ceiling tiles fell, kitchen equipment melted and the sprawling dining room was blackened. The four-alarm fire took two hours to bring under control, and nine firefighters and four civilians suffered minor heat and smoke injuries. Two weeks later, the 60-seat adjacent saloon was back in business, while work continued on the remainder of the restaurant and bar. Today, on the eve of its 101st birthday, the Oyster Bar now has four satellite operations: two in Tokyo, one at Newark Liberty International Airport (where, coincidentally, Brody and business partner Joe Baum launched their high-end restaurant career with the early 1950s opening of the Newarker) and, most recently, in Park Slope, Brooklyn. Last year in the midst of its centennial celebrations, the Oyster Bar claimed to serve its 10 millionth oyster. Cooks and owners have come and gone, but when it comes to the magnificent architecture, fresh oysters and bustling lunch counter, it seems little has changed in 101 years. Prohibition claimed many victims in New York City, among them the city’s most famous restaurant, Delmonico’s, which closed in 1923, as well as other well-known establishments of the time such as Shanley’s, Murray’s and Moquin. But among the first to close its doors after the Eighteenth Amendment took effect on Jan. 17, 1920, was the Holland House, located on Fifth Avenue at Thirtieth Street. Opened in 1891, the Holland House closed within a month of Prohibition taking effect. Having just finished William Grimes’ Appetite City, I am now into Last Call: The Rise and Fall of Prohibition by Daniel Okrent. Before reading this book, I hadn’t considered how or why Prohibition happened. Okrent tells the story well, describing movements such as the Women’s Christian Temperance Union and the Anti-Saloon League, as well as the soon-to-change political realities of the 1910s that allowed such an amendment to pass then. From reading old newspaper articles, it seems the reason for the closure was up for debate. A July 21, 1920 article in the Bismarck Daily Tribune suggests that changing times, not Prohibition, led the hotel and restaurant to shut down. “The bidding power of office seekers and not prohibition has caused many hotels in the vicinity of 42nd street to close recently, according to opinions of real estate men expressed today. Within a relative short time of one another such old and famous hostelries as the Holland House, Sherry’s and the Fifth Avenue Hotel have closed their doors and more recently the Knickerbocker—a relatively new and imposing structure—abandoned business. “Prohibition has done this,” cried many “wets,” but now one known hotel woman advanced the theory that the steady march of business toward the newer uptown sections was a paramount consideration of the men who decided to close their hostelries. This sounded like “dry” propaganda to me, but a New York Times article from June 9, 1928, seems to back up “changing times” explanation. “It is an old story, this change and decay and rebirth of hotels in New York. Some die of old age, like the downtown Astor House, or of obsolescence and the changing tides of residence and commerce, like the Buckingham and the Holland House. A few have been carried off, like the Knickerbocker, by the fatal seizures of prohibition; here and there a Windsor, by the hand of the destroyer. The most interesting piece I came across while reading old articles about the Holland House was a June 3, 1926, New York Times article about former Holland House bartender Harry Craddock, who reached out to his former New York patrons during his Prohibition “exile” in London. The list was shown to a man swinging a malacca stick and wearing a blue flannel suit, a sailor straw with a blue and white band, a blue necktie and tan shoes at the corner of Wall and Broad Streets yesterday afternoon at 3:30 o’clock. Craddock never did return to New York, but he became a famous bartender at the American Bar at the Savoy Hotel and, in 1930, he wrote The Savoy Cocktail Book. For more on his cocktails, check out this piece on Serious Eats. Regardless of the cause, the Holland House was converted to office buildings. A recurring New York Tribune advertisement for the Childs restaurant chain suggests that the ground floor of the Holland House was converted to a Childs. “The Old Holland House,” the advertisement read. “There’s music in the name. The old-timer fairly intones it—closing his eyes the while to picture Eulalia of Spain—now stepping daintily through its hospitable portals—now dining in state in its time-mellowed banquet room. The Old Holland House. Where “Joe” exchanged tips on what to eat for tips on what to buy and sell on Wall Street. Where a famous Western lawyer, after the formation of a great steel company, handed “Tom” and the boys a tip of three hundred dollars. The Old Holland House. It has not passed. but rather has kept pace with the march of commercial Progress. It is still an eating place de luxe, upholding old traditions of food goodness—old traditions of environment. Only now it is a part of the CHILDS system, with its modern innovations in food and service. The New Holland House. There’s new magic in the name—the magic of the house of CHILDS. “Joe’s” tips on what to eat are no longer needed. Instead, a perfect galaxy of choice comestibles is spread before the eye. One makes his own selection—the appetite is the guide. It looks as if, even then, independent New York institutions fell victim to chains. I’m looking forward to finishing Okrent’s book. Whether or not Prohibition led to the closure of the Holland House, one thing is for certain: Prohibition devastated the New York restaurant scene.